This positive, gentle music stimulates imagination and playfulness in small children and infants and evokes the playful child in adults as well! Cleverly using the high, bell–like tones of a child’s toy piano these sounds are particularly appealing to the sensitive ears of small children they attract and hold a child’s attention. This CD is not intended for sleep it is meant to encourage the imagination. Great for playtime, bathtime, getting dressed in the morning. Pre–school carers will love using this music during creative play. Need music for playtime and calming music for children? 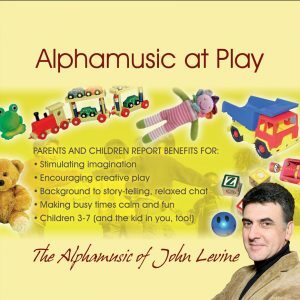 Alphamusic at Play is your answer. Composer and pianist, John Levine, based this work on the centuries–old use of pentatonic and lydian scales. Musical tension builds up slowly with no rush or rough discords. The spherical sounds can bring you to an alpha state within 4 minutes. It was Friday afternoon. Alex, Isabelle came back from nursery and Michael from school. Me and my husband Mark wanted to rest after a very busy day at work and all we dreamt of was a simple peace. No screaming, no fights, just a peaceful atmosphere. Alex and Michael started playing the new game calls ‘Jungle box’. Isabelle wasn’t happy with that and with her little persuasive charming way did everything that could to cause a fight between the three. She succeeded. The house has filled with a horrible noise and cries. I took out the CD and played it to the children. After a while they all calmed down. Isabelle stopped screaming and went playing jungle box alone. Then Michael and Alex joined her and for the first time they managed to play together in a peaceful atmosphere. It didn’t matter that little Isabelle didn’t know what this game was about. The only thing that matter was that the three played together in a friendly atmosphere. This is amazing. I have never seen them so calm and joyful. I am really happy that I have that CD with me. Some of the little children feel anxious when their parents first leave them there. One of the main challenges in a nursery is managing the rambunctious and anxious. It is difficult to efficiently move groups of children from the garden to inside or to get them to quickly and quietly sit down at the table. Even harder is naptime! Children, no matter how shattered they were didn’t want to go sleep. They preferred playing. Christine put the music on to see if it would work. Initially, the children were noisy as usually, but it didn’t take long for the staff to notice the benefits of the music. The children stopped shouting, calmed down and simply went to sleep. It was quiet amazing to the staff. When they played different music the effect wasn’t the same. Children didn’t follow the adult’s direction. Their behaviour remained the same. They were noisy and couldn’t focus. Other music simply didn’t work for them. The best CDs for them during their playtime are Alphamusic at play and My little Sea Shell. They don’t quarrel, fight or don’t shout so much when I also play them these CDs. I have much time for myself to relax now.